More from Accessories: Head to Toe, a symposium hosted by Colonial Williamsburg, March 12-16, 2011. No other accessory is so completely associated with the 18th c. than a wig, and preferably one dusty with powder. Dr. Anne Bissonnette, assistant professor in material culture & curatorship, & curator, clothing & textiles collection, University of Alberta, explored all-important hair in Off with Their Wigs! Traditions and Revolutions in Hairstyles, 1748-1804. Beginning with a survey of famous wig-wearers (the modern fashion for wigs began with Louis XIII of France, compensating for this own flagging locks in 1632), Dr. Bissonnette described how wig-wearing evolved from a court style to one that became almost universal in 18th c. England. Wigs were not only another symbol of rank, affluence, and fashion, but they could represent gravity as well in the wigs worn by doctors, barristers, and judges. While most wigs were in the natural colors of white, grey, blond, and brunette, later in the century there are references to wigs of lavender and rose – though Dr.Bissonnette cautioned that that could also be interpreted as the wig's perfumed scent instead of the color. But perhaps the most intriguing suggestion raised by Dr. Bissonnette concerned the influence of ancient Rome on 18th c. hair and wig styles. 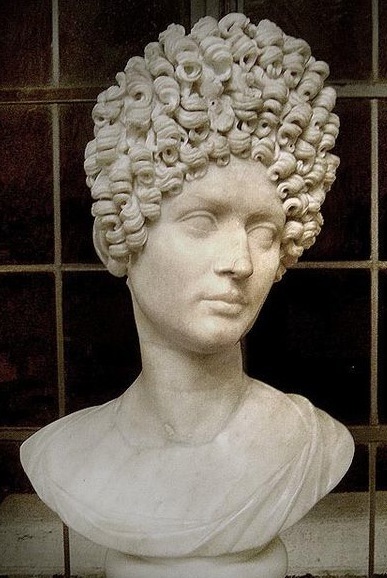 While most historians point to the cropped styles of the French Revolution as the beginning of classical styles, Dr. Bissonnette believes that the trend began much earlier in the century, spurred by the rediscovery of Pompeii in 1748, and there is an undeniable similarity between the tall stiffened curls of 18th c. wigs, upper left, and the hair shown on Roman portrait busts, lower left. Specialized clothing also carried underlying messages about health. A woman's riding habit, upper right, was fashionable and flattering, but it also advertised to the world that the wearer practiced the healthy and often-prescribed regimen of riding. Like modern doctors in scrubs, Georgian physicians wore distinctive clothing for their profession. While a surgeon making his rounds always wore his wig, a surgeon preparing to operate, lower right, wore a blue linen apron buttoned to his waistcoat and blue sleeves tied on to protect his arms. The traditional blue might have been simply because the color masked blood stains more readily than white – but can it be only an unsettling coincidence that 18th c. butchers are often depicted in caricatures wearing shirts of the same blue? Upper left: Reproduction 18th c. wig, Colonial Williamsburg. Lower left: Portrait of a woman of the Flavian period. Marble, 80s-90s A.D. Rome, Capitoline Museums. What struck me is that almost that same shade of blue is still a popular color for scrubs. When I worked in a hospital a couple years back, the halls were full of similarly-hued doctors and nurses. That is interesting, Susanna - I didn't realize the color had come back. Considering that the first surgeons were butchers-- literally-- I don't find the aprons at all coincidental. This is the first time I have heard or seen of such aprons. I am just surprised that the aprons appear to button on to the waistcoat. I think the female aprons were pinned to the bodice. There is very little evidence that adult English women wore aprons with bibs that were pinned. It is, however, commonly seen in paintings of lower class French women. This has been discussed at great length on the 18c Woman group (on Yahoo).